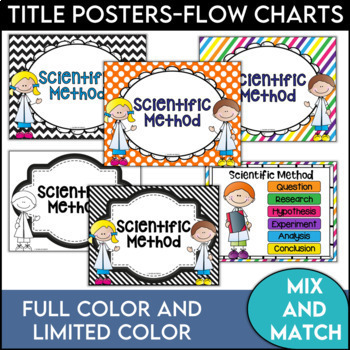 This set of Scientific Method posters will help your students see the steps of the scientific method in gorgeous bright multi-colored backgrounds and white frames. Students can follow along as steps of the process are completed and they will love the bright colors and graphics. This is one of the first sets of posters I created for my store and they are still my favorites! This set has terrific color! Featured are the colors of:orange, green, pink, purple, yellow, and bright blue! The package contains ★THREE★ versions of the poster set. The first version has these colors in chevron backgrounds and white frames that match. The second version has black and white backgrounds with graphics in color. The third version has white backgrounds and black/white graphics. All sets feature the Scientific Method! ★ Along with the posters, you will have 5 title posters and 2 flow chart posters from which to choose. ★ You will also have a set of Word wall strips. The same colors are used on these strips with white centers. These are sized with two on each page. 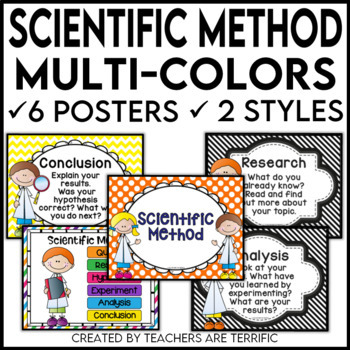 In addition, a graphic organizer is included that may be used with just about any experiment using the scientific method. There are two versions of the graphic organizer- with and without color. A sample organizer is also provided with student answers. 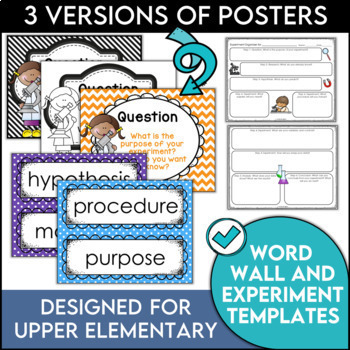 This packet is intended to be used to enhance and decorate your science classroom and save you valuable teaching time- AND give you choices of poster designs! It does not contain lessons on the scientific method. 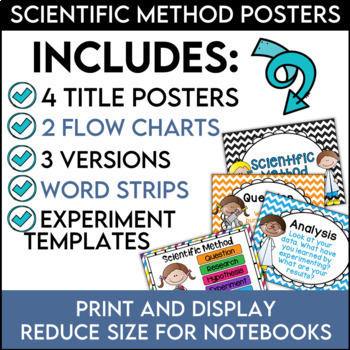 The package specifically contains: Cover sheet; 3 Sets of 6 Scientific Method posters entitled: Question, Research, Hypothesis, Experiment, Analysis, and Conclusion; Set of Word Wall Words for the Scientific Method (Including: analysis, conclusion, control, data, data table, experiment, hypothesis, materials, procedure, purpose, question, research, result, variables); 5 title posters; 2 flow chart posters; Graphic Organizer to use with any experiment; Graphic Organizer with sample answers; and Credits Sheet. Be the first to know about my new discounts, freebies and product launches! All you have to do is follow my store. Look for the green star next to my store logo and click it to become a follower. It’s that easy to receive email updates about Teachers are Terrific! Keep in Touch with Teachers Are Terrific!